In today’s ultra-competitive manufacturing environment, worldwide competition is fierce; time is, truly money! Efficiency, productivity, responsiveness and safety are key factors to success in your daily business. Instant, seamless, effective communications between receiving, manufacturing, warehousing, logistics and the front office is a vital tool to achieving maximum yield and your goals. 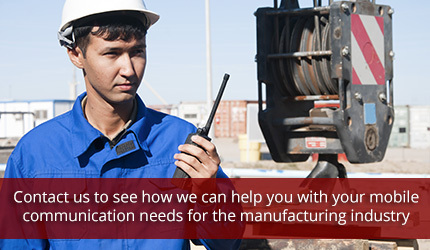 Typically, the complex nature of manufacturing and heavy industry impose unique challenges to clear communications. Today’s ruggedized two-way radios and wireless devices provide static free voice and data communications that can overcome these common workplace challenges. Radios are the ultimate hands-free portability device. Radios ensure smooth, speedy shift changes. Radios are a time and resource efficiency device. Radios empower workers to respond rapidly to workplace disruptions and emergencies. Radio integration tools eliminate communication silos, allowing the freedom of complete connectivity across platforms; office phone systems, voice mail, smart phones, email, data systems and work orders. Today’s ruggedized wireless devices and their numerous benefits, when properly deployed, can help your team optimize your facility’s output and achieve scheduled targets. Effective communication equals efficiency, a smooth workflow, rapid response to exigent circumstances, accountability and an information flow providing your operations with real-time data. Mobile Communications has a long history serving the needs of manufacturing in North Carolina; experience that is unsurpassed and service based. Even so, our mission is to partner with you, to listen and identify the specific communications issues with which you’re faced and, combined with our experience, offer budget conscious options that eliminate your pain; providing seamless, effective communications across platforms.